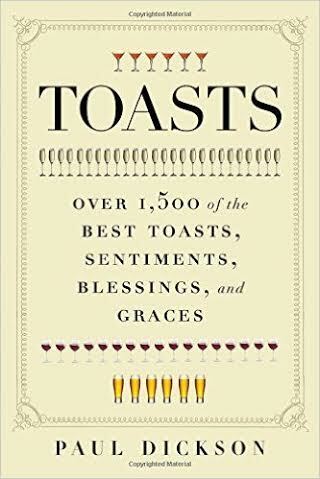 For anyone who will ever face a sea of expectantly raised glasses, or anyone who is fascinated by words and word-play, this rich compendium of toasts for every occasion will prove as entertaining as it is useful. The best toasts ever proclaimed (and a few of the worst), funny and sentimental toasts, cynical and heartfelt toasts, old-fashioned and contemporary toasts, justly famous and unjustly forgotten toasts ... they're all here in the latest compilation of verbal fun from wordsmith extraordinaire Paul Dickson. Impossible to put down when browsing and easy to use when looking something up, it's one of those books that will never gather dust on the shelf. Weddings, graduations, anniversaries, births (and birthdays), family reunions, business dinners, and other occasions are all included, along with tips for the toastmaster, ways to says "Cheers!" in fifty languages from Albanian to Zulu, and other toasting topics. This is a book that will be helpful to anyone who ever expects to be called on to give a toast. It begins with a brief introductory history of toasts and toasting, pointing out that the custom of drinking to the health and prosperity of another is an ancient one. The book is arranged by broad topics from age ("May you enter Heaven late") to weddings ("May you grow old on one pillow") to friendship ("Here's to a friend. He knows you well and likes you just the same."). Some of the quotes are from literature or famous people, but there are many old anonymous ones, too. Sections on effective toasting, odd customs, and the like are also included. Libraries needing to expand their quotations collections might want to buy this volume. A useful reference. May all dinner speeches be as succinct as "Good drink, good meat, good God, let's eat."